Massa, M.; Guevara, I.; Romero, F.; Puig, C.
Massa, M. [et al.]. 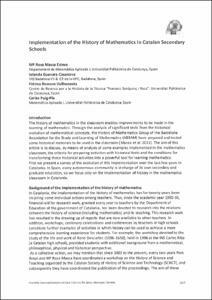 Implementation of the History History of Mathematics in Catalan Secondary Schools. A: International Conference of the European Society for the History of Science. "5th International Conference of the European Society for the History of Sicence. Book of Abstracts". Athens: 2012, p. 82.